The Quantek Model 908 CO2 Analyzer is designed for spot measurement and analysis of carbon dioxide levels. Analysis ranges of 0-2000ppm up to 0-100% vol/vol. Simply introduce your sample gas flow into the inlet of the Model 908 portable CO2 analyzer, and see results on the LCD within 15-20 seconds. 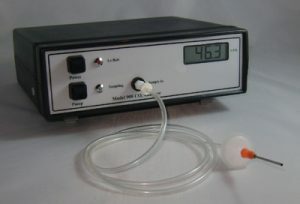 The inlet accepts a flow rate of 50cc/min to 1000 cc/min. If you don’t have a source of flow or positive pressure, the analyzer can be equipped with an internal pump to draw in sample gas for analysis. The Model 908 portable analyzer weighs about 2 lbs and is easily carried via shoulder strap. Battery operation is included and provides approximately 10-12 hours of run time. Simply connect the included sample tubing to your inlet connector or port. If you have a source of flow, you will achieve a reading in about 15-20 seconds. If you do not have a source of flow, the analyzer can be equipped with an internal sampling pump to draw sample into the analyzer. The sensor design has a low internal volume and requires only a low sample flow of about 5 to 1000 cc/min. Our market leading CO2 sensor uses the latest in dual-wavelength NDIR measurement principles, reducing drift and allowing for a single point calibration. While the sample introduced should be clean and dry (non-condensing), should moisture enter the analyzer, the Model 908 is equipped with an internal moisture trap filter. This provides a last barrier of protection, and is user-replaceable (we provide spares). The instrument uses a solid-state infrared sensor which has no moving parts, a compact optical cell, and microprocessor-based calibration factors using a 6th order polynomial equation to linearize the full range measurement up to 100%. Infrared CO2 measurements are inherently non-linear, especially over a high range of concentrations. The math algorithm used in the 906 yields more accurate measurements over a much wider range of concentrations than other methods. The Model 908 can be equipped with a data logger which fits in the carrying case. This data logger will continuously collect the readings from the analyzer. Use the included software to analyze the data, conduct statistical analysis (such as analyzing averages and standard deviations). The 908 CO2 analyzer is equipped with an advance 10 cell NiMH battery pack. The charger module plugs into any international 100-240V outlet, for charging or continuous operation. The portable CO2 analyzer is backed it up with a two year warranty, twice the industry standard. The advanced design allows an output requiring less frequent calibration. It provides a stable, drift-free linearized voltage or current output that is much less susceptible to external electro-magnetic interference than conventional analog electronics. Origin of Goods – Our goods are manufactured in the U.S.A.
Internal Pump – A mini diaphram pump installed inside the analyzer, and draws approximately 5 cc per second. Great for situations where there is no source of flow. Expected -pump lifetime is 8-10 years. The pump can be used in two modes – one mode is clicked “on” and leaves the pump running until unclicked. Pressing the switch lightly enables operation according to the user adjustable potentiometer timer. Tubing / Fittings – if you need a specific tubing for an access port, or a different type of probe, please inquire.